Ready for some luxurious analog splurge? 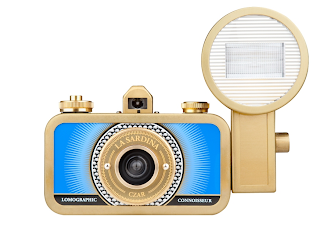 La Sardina Czar Metal Edition camera is a humble sardine can-inspired snapshooter dressed in shimmering brass coat and elegant blue details. Together with the powerful Fritz the Blitz flash, they’ll indulge you in thrill-soaked wide-angled adventures! Retro cool. 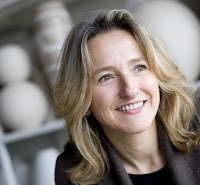 Pia Wustenberg began experimenting with the materials that surrounded her. Her background as a cabinet maker led her to shape the material with traditional wood working techniques. These designs are made using processed paper. Check out how she does it! Young Israeli designer Guy Mishaly is blowing up. Well, stools, that is. 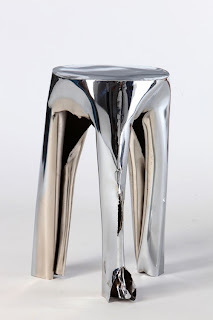 His series of stools, called Blast, are made using explosives. 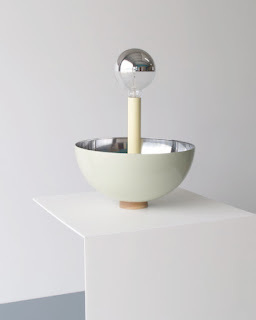 Working on ideas for his graduation project as part of his degree in industrial design at the Bezalel Academy of Arts and Design in Jerusalem, he was looking for a single way to create a variety of different objects. Check out the video of how Guy uses destruction to create. A kid’s room with an extraordinary wall unit attracts your attention immediately. It serves as a storage system, a closet, and a playing area at the same time. It has closed drawers and open round sections perfect for storing toys. The major highlight is in the center – a stairway leading to the “roof” of the closet covered with soft pillows. A child can climb up the roof both with the help of the staircase and a rope fixed in the left corner, the circles in this case being additional stairs. One of the walls is decorated with soft puzzle-shaped panels made according to the designers’ idea. 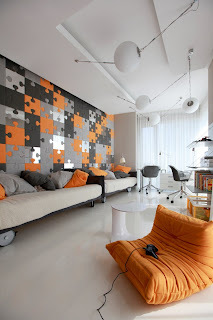 Here they chose one major color that serves as an accent – a positive orange combined with 3 tints of grey. When the boys grow up, the panels can be taken off to make the interior more composed. Click for more of this amazingly inspiring Moscow apartment. Thanks to our friends at Contemporist! Furo is not happy being just a bowl or container for the living room or office. That job is just not fulfilling enough. Furo needs an outlet for its creative drive so it stands up on its tall legs and demands your attention. 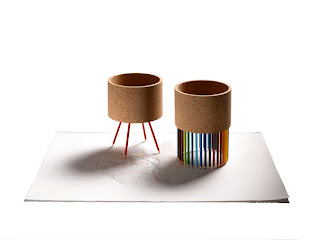 Each leg is a colored pencil so when the sharpened tips are turned outward, Furo becomes a drawing device. Slide it around over a sheet of paper and watch as the surface beneath comes alive with perfectly symmetrical lines (remember your first spyrograph). A textured cork body mounted on 36 or 4 pencil-legs, which makes for two different configurations and drawing patterns, Furo can be dismantled for easy storage or to, literally, cut down on its artistic outbursts. Thanks Materia! Line Deppingcreated 'Tool Boxes' in an effort to explore how we store things. 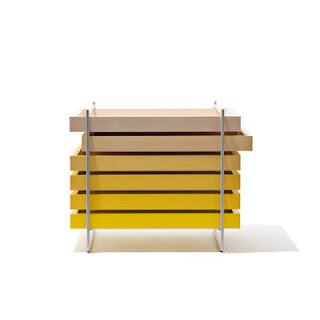 Her goal was to challenge the common perception of a chest-of-drawers and to reveal the drawers openly to the beholder. She provides a rack for the boxes to make it easy to pull them out even when they are 'stacked' with other boxes. Each of the solid wooden boxes is designed as an independent tray that can be pulled out to either side or pulled out completely and placed on top. The top drawer is open and also forms the top of the piece. Thus, instead of concealing the contents, they lay it bare for all to see, and the functional quality is obvious. We love functional quality! 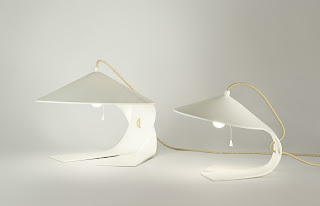 The apparent simplicity of the Hanoi Lamp by Federico Churba is actually a harmonious complexity of shapes. This lamp is realized in one horizontal plane that acquires form and volume through the bends of the material. A formal simpleness defined by details. A warm and intimate light, like the kind gesture of someone bowing down in greeting. We welcome the great design. Here's a really gorgeous piece of furniture. The sofa by itself is stunning. 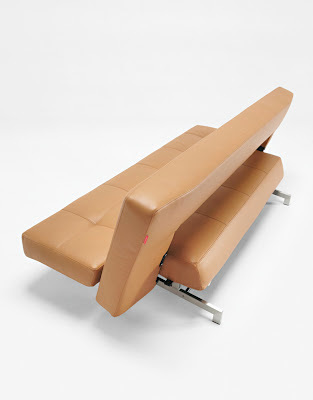 The adjustable back rest can be set in sofa, lounge and bed position, and the two sides of the seat - the “wings” can be lifted with a simple click. We love multifunctional furniture! It's time to get that garden going. For those who prefer the luxury of their own indoor oasis, we have just the thing. It's garden as art by DOKTER AND MISSES. 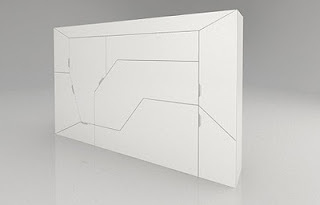 This unusual take on a murphy bed was envisioned by Latvia based designer Rolands Landsbergs of Boxetti. He created a series of modules that are capable of transforming into various functional objects – beds, desks, storage and so forth. Each configuration can be hidden away into a small appealing box. Studio apartment dream, the items blend with the surroundings when closed and unfold to reveal their function when needed. The bedroom unit (our personal favorite) includes a double bed, night stand and a wardrobe. The unit is equipped with a spotlight and an ambient lighting fixture above the headboard. All necessities in one small package. The goal was to create a light that would illuminate the table surface as well as the ceiling while leaving the space in-between free from direct light. The half mirrored globe bulb reflects all the light down and onto the table surface while reflecting the light captured in the hemisphere upward where the warmth of the textured yellow post is added to the ceiling and surroundings. We want this. Simplicity governs Vito Selma's bursts of creativity, and simplicity dictates the complex contours he forms his choice material––wood––into. Art indeed is how this young designer chooses to approach his craft. Rather than express full command over what most perceive simply as means to making furniture, wood occupies a very personal space in his world. He refers to it as his 'partner', implying an equal give and take of complications and accomplishment, a mutual understanding. Despite the singular material with which he devotes himself, one simply cannot help but marvel: "could wood indeed take such a shape?" Yup. 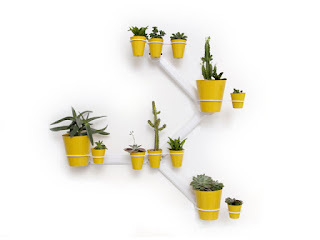 This simple multifunctional interior piece can be transformed into a toy for kids. 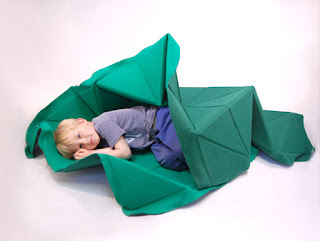 It can work as a carpet, a couch cover and can be converted into a landscape for toy cars or fort to play in. It works off of a simple grid of triangles made of dense foam covered with wool felt. Frost Produkt participated at the Norwegian Prototypes exhibition in London. The brief for the exhibition was to design products that could fit in to a hand luggage suitcase. The result was the series “When Circles Collapse”. 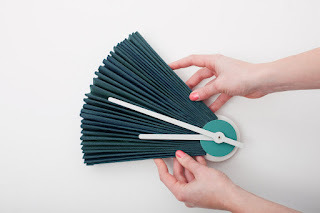 Clock: The Clock's fan has 60 folds, each one representing one minute of time. After unfolding the fans, the position is held by twisting and then pushing the center disc. The textile aesthetic weds the clock elegantly with domestic furniture pieces as opposed to a typical clock. 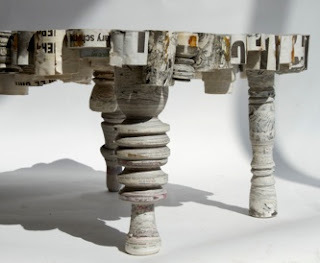 Side table: The table top works as a wedge locking the legs into a fixed position. Once locked into position, the legs leave a looped gap above the table surface that can be used as handles. The subtle difference in leg size creates an honest and asymmetrical look. 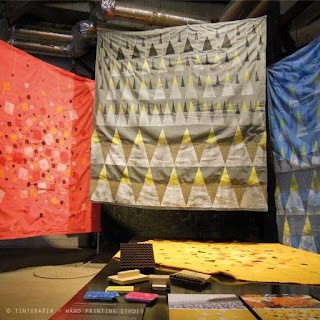 Maria João createsher own prints on her own fabrics in the Tinturaria' or traditional 'dyer's studio', in Portuguese. In her little space by the river, she prints and dyes fabrics, by hand, with traditional techniques. It is an old and almost extinguished art, since today everything is ruled by big machines and textile industries. These are exclusive and unique pieces done with 3 techniques - dyeing, block-printing and embroidery - and can be used as bed covers or wall hanging. A perfect juxtaposition to contemporary, sleek furnishings. 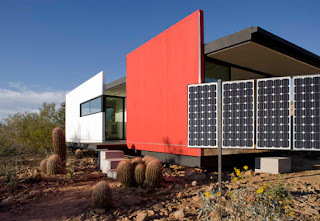 Mod fab is an amazing modern prefab house designed by students at Taliesin West in Scottsdale, Arizona. Designed for sustainable living in the desert, this one-bedroom, 600-sq.-ft. house features paneled construction allows for off-site assembly – a big bonus both economically and environmentally speaking. This prefab house incorporates a variety of innovative eco-friendly features in this “unplugged” design, including low-consumption fixtures, rainwater harvesting technologies, greywater recycling, natural ventilation, solar orientation, and photovoltaics to reduce energy and water use, all to minimize environmental impact while providing a stylish and secure lifestyle. We want one. 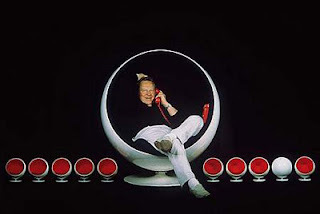 We definitely want to furnish one! The flowers are in full bloom. And so is the nesting instinct. At dane decor, our mission is helping make your home the best place to be. And this month, we are featuring incredible pricingon some of the world's best modern and contemporary furniture designs. Like the amayzingly awesome Sit-Stand Desk. We invite you to start feeling better inside. The colored slips Paola Paronetto uses to decorate her pieces are created in her studio with different clays by a process of separation. The result is the magic of raw nature and hands-on manufacture combined with the aesthetic purity of elegant delineated shapes and colors which reflect the artist's deep sense of respect towards nature. We love you Paola! Two young Norwegians, Andreas Gjertsen and Yashar Hanstad, take a hands-on approach to do-good design with projects in remote Thailand, Bangkok, Sumatra, and beyond. 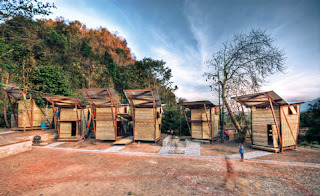 They moved to western Thailand and spent a year designing and building a series of houses, a library, and a bathhouse for orphans along the Thailand-Burma border. We love these! Thanks Dwell for the post. Mother's Day is May 13th!